Here, Mordecai pokes fun at Haman on account of the fact that his father was a barber, bath attendant and cosmetician in “Kefar Qarnos.” In the Bavli, Mordecai claimed that it was Haman who held that job. Interestingly, some of the motifs mentioned in this dialogue are also found in an Aramaic poem for Purim published in Joseph Yahalom and Michael Sokoloff‘s Jewish Palestinian Aramaic Poetry from Late Antiquity. 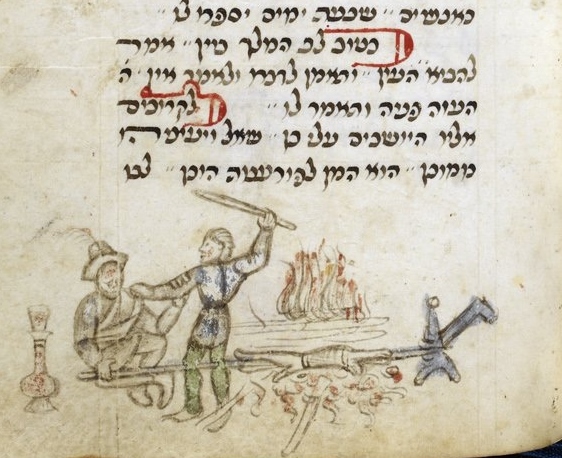 The poem- like the Bavli– claims that Haman himself is the one that had the lowly professions: “זמר הווית בכפר / ומקזן וספר / ובעית סופר” (poem 33 line 39); “You were a singer in the village\ a blood-letter and a barber\ and you sought out barber’s tools.” It is fascinating to see that the song seems to degridate the position of a village-singer. On the identification of these villages see Uzi Leibner, “A Galilean-Geographical ‘Midrash’ on the Journey of Job’s Servant-Lads” (Cathedra 120), and on the larger phenomena of reading biblical stories as having taken place in the Galilee see Elchanan Reiner, “From Joshua to Jesus: The Transformation of a Biblical Story to a Local Myth (A Chapter in the Religious Life of the Galilean Jew)” (Zion 61). Solomon Buber, who edited Midrash Panim Aherim, notes that this also appears in the Targum Sheni to Esther, and Spiegel also mentions a possible connection to b. Megillah 13a. Psalm 30 is reread as a dialogue between some of the main characters of Esther, and David is then understood to have “foreseen” the events of the megillah. The Qalliri’s piyyut is memorialized in the Nuremberg Mahzor and by Jewish communities worldwide that still recite it today. 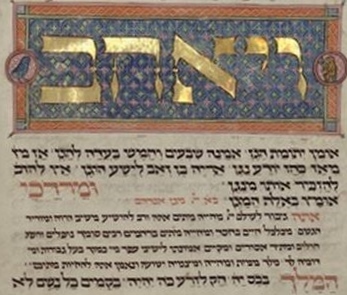 Almost two decades ago, Shulamit Elizur published a later version of the piyyut found in two Cairo Genizah manuscripts, suggesting that it may be an adaptation made by the Qalliri himself for use with a choir. On this and other aspects of the piyyut, I highly advise reading Itai Marienberg-Milikowsky’s short essay on piyut.org. Captions can be left in the comments section below. A freilechen Purim! Keep it safe. Don’t blame me, the Stam made me do it.